Looking for a Halloween or theater costume for the perfect theatrical presentation or school play? 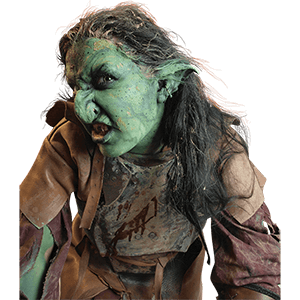 Medieval Collectibles has the largest selection of quality Halloween costumes, Halloween decorations, Halloween props, and accessories available. We have Renaissance costumes, medieval costumes, costume jewelry, pirate costumes, and costumes from your favorite movies or plays. Maybe you picture yourself as a fairytale princess? If so then look no more; we have Cinderella costumes, Snow White costumes, and Belle costumes for adults and children. If you are a history buff, we also have a huge selection of Renaissance costumes and medieval knight costumes. Want to go even further back in time? Try our Greek goddess costumes and roman togas. What could be more fun then wearing one of our Egyptian costumes and being Cleopatra for a night? Looking for that western look? We have it, gunslingers, cowboy costumes, cowgirl and Indian costumes, and all the costume accessories to go with them. Always wanted to rescue the damsel in distress? Slip into our Spiderman costume and spin your own web. Don't forget your significant other, as they'll look great in their own costume that matches your choice, whether its medieval, fantasy, gothic, or steampunk. Whether you're searching for an adult Halloween costume or attending a Renaissance Faire, Medieval Collectibles has just the right costume for you. Attend a Halloween party in medieval style. Will you be a peasant or a royal? Browse our selection of child and adult Renaissance costumes and clothing for more. If you are browsing for a mens costume, then you have come to the right place. 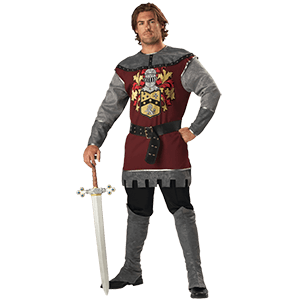 Here at Medieval Collectibles, we offer a huge assortment of mens costumes, in dozens of different styles. If you are looking for a pirate costume, we have several different varieties, so you will have to decide if you want to look like a lowly deck-swab or if you want to be the captain of the ship. Or if a gothic costume is more up your alley, then you will need to decide if you want to be a dark vampire, a grim reaper, or a scary ghost. Or if you want to be something with a little more medieval or renaissance flair, then you have the biggest choice of all, ranging from paupers to princes with everything else in-between! We offer all these options and more within our mens costume section! And do not think for a second that just because they are costumes, they are not suited for uses outside of Halloween; many of our mens costumes are quality pieces that can be used any time the situation calls for a good costume: whether you are dressing up for the holiday, going out to a themed convention, or just getting together with some friends in costumes, these mens costumes are perfect for a staggering array of situations, so pick one (or more) up today! If you are looking for the perfect womens costume, then here is where your search begins, at the Medieval Collectibles womens costume section. In this section we offer a wide assortment of different styles of costumes, ranging from the darkly gothic to the divinely bright, to ensure that no matter your preference, we offer a style that suits your whimsy. Within you will find pirate costumes perfect for raiding the high seas, gothic costumes perfect for stalking the darkest nights, and medieval and renaissance costumes that are beautiful enough to make any woman into nobility. We even offer accessories, from pirate hats to costume capes; we even offer fishnet stockings! To top it all off, many of these costumes are not just meant for Halloween; you will find that many of these costumes are great for any occasion that calls for dressing up, whether you are going to a renaissance fair, a themed dance among friends, or even a themed bachelorette party! So whether its Halloween or not, Medieval Collectibles womens costumes are great for dressing up; not only are they fun to wear but incredibly appealing and stylish, too! Sometimes, finding a good, stylish costume is a hard thing to do. 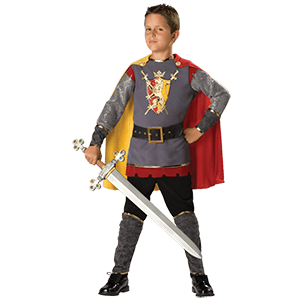 Luckily, Medieval Collectibles carries a number of stylish and fashionable teen costumes, to ensure that when that time of the year rolls around, everyone, teenagers included, can enjoy Halloween to its fullest. In our teen costumes, they will not have to worry about looking dorky or uncool, because not only are our costumes, well, costume-y, but they are also extremely cool, not to mention extremely stylish and fashionable. 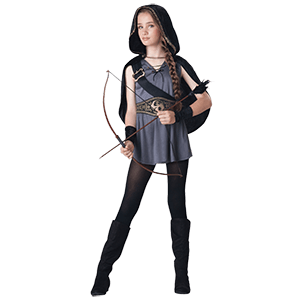 We offer teen costumes in a few choice varieties, including common themes like pirates and vampires, as well as a few medieval and renaissance themed costumes, like gladiators and gypsies. 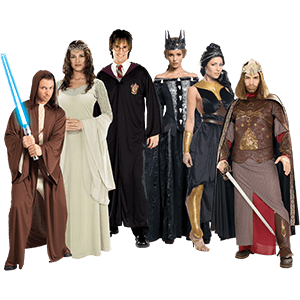 Halloween is a time-honored tradition and, to be honest, it is really too much fun to just let anyone sit and pass the day away, doing absolutely nothing; show your teenager the Medieval Collectibles Teen Costumes section and get them a wickedly cool costume. Its the perfect way to get them into the Halloween spirit! Looking for great quality costumes for your boys? Look no further. If your child is into Medieval Knights and Pirates of the Caribbean, we have the costumes that they'll love. These costumes are very nice quality and are perfect for any costume or themed parties, Halloween and general play and dress up that kids love to do. You'll find costumes for children ages 2-12 in this section. Anyone who has girls knows they truly are little princesses. Your little princess deserves the best and we have the best selection of costumes. 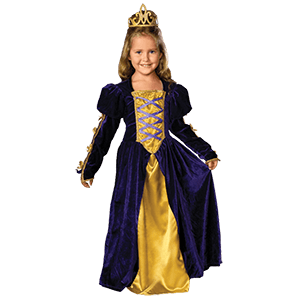 We have cute little Princess and Queen costume gowns, Juliet and Noble costume dresses and sassy Pirate costumes. These costumes are very nice quality and are perfect for any costume or themed parties, Halloween and general play and dress up that kids love to do. You'll find costumes for children ages 2-12 in this section. Looking for that perfect Halloween costume this year? Well, we have licensed movie costumes from all the big hit movies from the past and current year. We have The Dark Knight (Batman) Costumes, Indiana Jones Costumes, Lord of the Ring Costumes, 300 Movie Costumes, Star War Costumes, Halo 3 Costumes, Sweeney Todd Costumes and the Corpse Bride Costumes (A Tim Burton Movie). Our movie costumes can be used for Halloween, Birthday parties, Renaissance fairs or LARP events. We carry all the popular characters from the movies and great accessories like wigs, swords, weapons, and masks so you can complete your look. Our costumes are not only great for Halloween, but they are appropriate for any occasion that calls for them, like costume parties, conventions and even bachelor parties. We will have more licensed costumes coming soon from other popular movies of the year. Accessories can be what really sets your costume apart from others. We offer fantasy and period styles wigs, Medieval and Pirate hats, costume shoes and boots, plastic costume weapons and party props. Keep in mind, everything found under our Costume section, is a costume. If you are looking for something more authentic, checkout our clothing section. But there are tons of fun items here that can be used for costume parties, Mardi Gras and Halloween. When you embark upon your next adventure, why not take your most loyal companion along with you? With our selection of pet costumes, your furry friend can now get in on the fun of medieval, Renaissance, and fantasy dress-up. Take the family pet along on your next trick-or-treat outing, as our fantasy costumes for pets are great for Halloween celebrations. 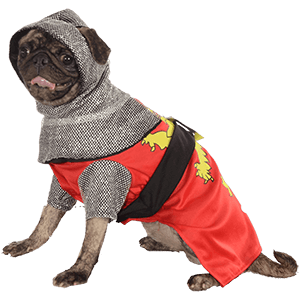 You will find no squire more faithful than beloved Fido, so dress your dog up in one of our medieval knight pet costumes. Shop our selection of pet costumes for dogs and cats in a variety of sizes and styles to suit any dress-up occasion, whether getting outfitted for Halloween or to accompany you at your next Renaissance festival. For any pet lover who yearns to involve their favorite animal friend in their historical dress-up events, we have the medieval and fantasy pet costumes to help you and your pet achieve your dreams.